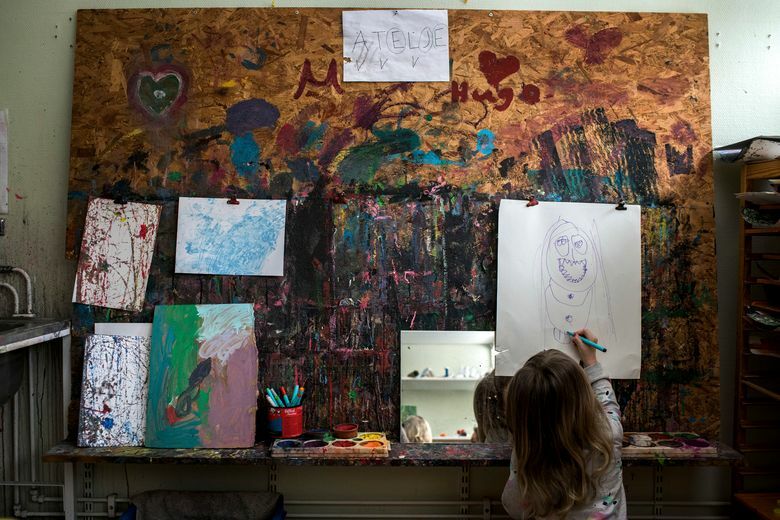 Science may still be divided over whether gender differences are rooted in biology or culture, but many of Sweden’s government-funded preschools are doing what they can to deconstruct them. 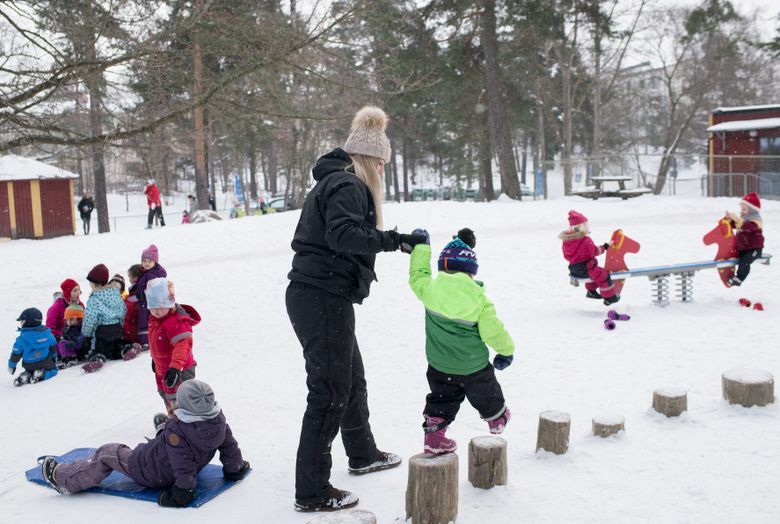 STOCKHOLM — Something was wrong with the Penguins, the incoming class of toddlers at the Seafarer’s Preschool, in a wooded suburb south of Stockholm. The boys were clamorous and physical. They shouted and hit. The girls held up their arms and whimpered to be picked up. The group of 1- and 2-year-olds had, in other words, split along traditional gender lines. At this school, that is not OK.
Their teachers cleared the room of cars and dolls. They put the boys in charge of the play kitchen. They made the girls practice shouting “No!” Then they decided to open a proper investigation, erecting video cameras in the classroom. It is normal, in many Swedish preschools, for teachers to avoid referring to their students’ gender — instead of “boys and girls,” they say “friends,” or call children by name. Play is organized to prevent children from sorting themselves by gender. A gender-neutral pronoun, “hen,” was introduced in 2012 and was swiftly absorbed into mainstream Swedish culture, something that, linguists say, has never happened in another country. On a recent Friday at Seafarer’s Preschool in Hammarbyhojden, south of Stockholm, Elis Storesund, the school’s in-house gender expert, sat with two teachers of the 4- and 5-year-old Seagulls, reviewing their progress on gender objectives. Storesund, 54, nodded. “They are trying to understand what it is to be a girl,” she said. Esteka looked frustrated. She had set a goal for herself: To stop the children from identifying things as “for girls” or “for boys.” But lately, her students were absorbing stereotypes from billboards and cartoons, and sometimes it seemed like all the slow, systematic work of the Seafarer’s Preschool was flying away overnight. “There is so much they bring with them,” she said. Sweden’s experiment in gender-neutral preschools began in 1996 in Trodje, a town near the edge of the Baltic Sea. The man who started it, Ingemar Gens, was not an educator but a journalist who dabbled in anthropology and gender theory, having studied Swedish men seeking mail-order brides in Thailand. Newly appointed as a district “equal-opportunity expert,” Gens wanted to break down the norm of stoic, unemotional Swedish masculinity. “We tried to do that — to educate boys in what girls already knew, and vice versa,” said Gens, now 68. A wave of criticism broke over him, but that was expected. Teachers were required to review videotapes of themselves with the children, to identify subtle differences in the way they interacted with boys and girls. Many found they used more words, and more complex sentences, with girls. Helena Baggstrom, who taught at one of the schools, recalled watching footage of herself in a cloakroom, attending to children as they bundled up to go outside. She saw, to her shock, that she had helped one boy after another get dressed and run out the door. The girls, she realized, were expected to dress themselves. The strategy of separating boys and girls was later set aside in favor of a “gender-neutral” approach intent on muting differences. Still, the spirit of Gens’ experiment had percolated through the government. A columnist and mathematician, Tanja Bergkvist, one of the few figures who routinely attacks what she calls “Sweden’s gender madness,” says many Swedes are uncomfortable with the practice but are afraid to criticize it in public. “They don’t want to be regarded as against equality,” she said. Elin Gerdin, 26, part of that first wave, is studying to be a teacher. In appearance she is conventionally feminine, her long, dark hair coaxed into spirals with a curling iron. This is something she points out — that in appearance she is conventionally feminine. It is the first sign that she views gender as something you could put on or take off, like a raincoat. Gerdin’s friends have begun to have babies, and they post pictures of them on Facebook, swathed in blue or pink, in society’s first act of sorting. Gerdin gets upset when this happens. She makes it a point to seek her friends out and tell them, earnestly, that they are making a mistake. This feels to her like a responsibility. Otto prefers to wear dresses because he likes the way they fan out when he spins, and it does not make him unusual here. Up until now, no one in Otto’s life — not his grandparents, or baby-sitters, or fellow 3-year-olds — has told him boys do not wear dresses, said his mother, Lena Christiansson, 36. She would like this to continue as long as possible.